Today, as I didn’t have an ‘April daily photo’ from the archives, I went out for a wander to take a few. Of the many, this one seemed most appropriate. Regular readers will know of my appreciation of this soon to be gentrified area, Foss-side. The back of the Banana Warehouse is an important part of it. Back in 2004 when I first took a photo of this view, where the back of the place meets the River Foss, the chap hanging off the back of the building was holding a chair. I’ve taken photos from more or less the same place every now and then over the years, but I’m not sure when the chair he was holding fell into the Foss. We can perhaps investigate that later by scrutinising the photos. For now I just want to acknowledge the fact that, as many local readers will know, the Banana Warehouse is soon to be no more, as covered in York Mix. The frontage of the building, onto Piccadilly, is to be kept, the last I heard. But its charming and characterful back won’t be. And between the two — though I haven’t looked at the plans — I suspect we’ll have another of those huge tall light-blocking things we now have to build on every valuable piece of city centre land. 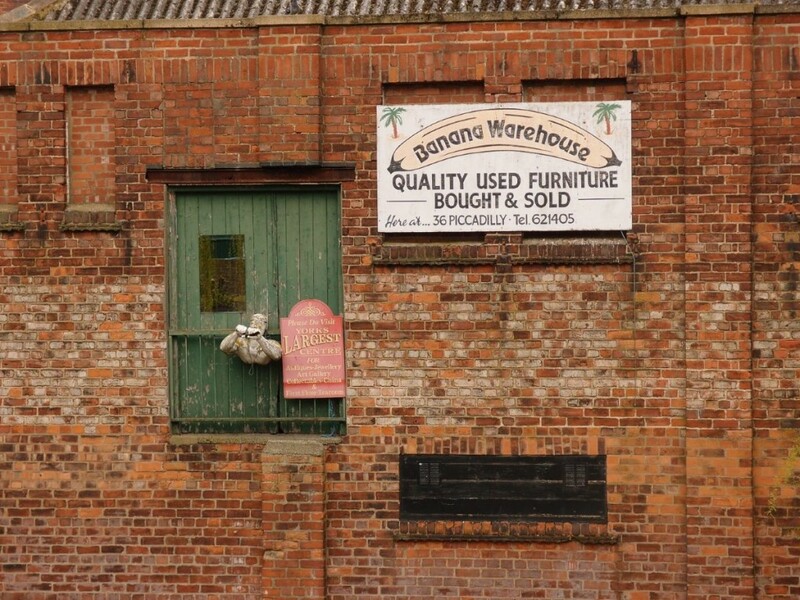 The Banana Warehouse tells many stories, the kind of stories I like. This whole area does, this scruffy bit of our ‘second river’. Real York. Or York as we knew it. All changing. They call it improving, but I’m not so sure, as the massive light-blocking structures of the ‘could be anywhere’ type replace the charming and characterful, quirky places.